The following websites (and fellow nomads), magazines and books helped us a lot in the planning phases. Certainly, the following lists are by no means complete. If you have other interesting links, books or other bits and pieces of information you think we should add, please let us know! 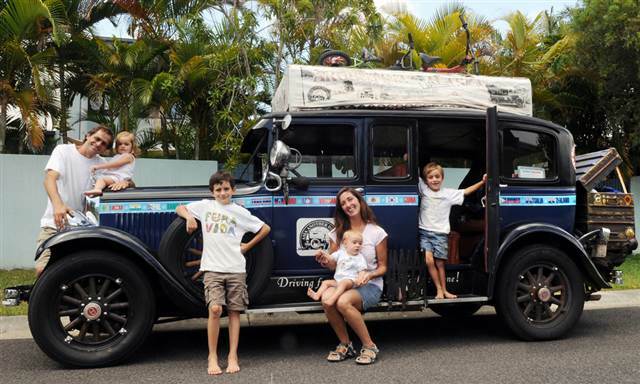 The Bell family is a South African family of four driving their Land Rover Overlanding the Americas (for now...). They are currently travelling from Argentina to Alaska, travelling in their Land Rover Defender 130 which has been modified for overland travel. Once they have circumnavigated the South American continent, they will be travelling to Alaska and who knows where from there. Lena and Ulli are on a trip through Africa for at least one year starting in West-Africa ... after that, they might go over to South America to continue their journey. In January 2000, Candelaria and Herman Zapp set off for a half-year-trip from their home-country Argentina to far-away Alaska in a 72-year-old car ... Today, more than 14 years later, they are still traveling. They were outward bound as a couple and now, they're together with their four children that were conceived, born and raised "on the road" ... read our review of their book "Spark your Dream"
Our colleagues from the boarding school "Marienau" have traveled through South America for half a year together with their son Jasper in their blue Mercedes van called "Ben". Ian and Kevin from England plan to travel to South East Asia in their Toyota Hilux called Surf. They say that "it’s a lot more more than just a road trip, it’s us changing our lives and changing routine for a real adventure". Hope to hear from you two soon! They have been on the road for 11 years so far and it seems for the nearer future they have made no plans to return to the Netherlands and settle down. Wonderful people, great truck (Land Cruiser BJ45) great website and "Overlanders of the Year 2014"! In 2011, Roland and Iris start their trip to India and Nepal in their old Land Cruiser BJ45. 14 months and 50,000 kilometres later, they return to the Netherlands with a bunch of stories to tell. Tobias has traveled to many countries in his good old Land Rover, experienced warmth and friendship and survived an attack by bandits in northern Kenia. The website is very informative and really suspense-packed. During 2010 and 2011, Andrew, Anne, Jessica and AJ (Andrew John) went on an overland trip from the UK to Australia in their 1998 Land Rover Defender 110 300 Tdi County Station Wagon. Impressive overland journey, a great blog and wonderful people! For the last 10 years they have been on the road now, traveling around the edge of Afrika, to India and also in the Middle East - normally in their violet truck called “Pistenkuh”. The website is full of information and their books and dads simply are great! Their honeymoon was in a Lada offroading in Iceland ... that started their overland dreams. The day came (in 2013) and they left their home, quit the jobs, packed in their two children and travelled the Panamerican Highway starting in the USA traveling southwards. Robert, Carla, Tanja and Max are now back in Europe ... and most certainly planning their next trip. Fellow islander Claudia travelled to Australia, Iceland, Africa and the Middle East in her Toyota Landcruiser and currently is slow travelling through the Americas down to Tierra del Fuego. The South African 4x4 and overland forum with an immense amount of information on overlanding, 4-wheel-tracks and traveling in Africa, especially the southern part of Africa. “Australian Land Rover Owners“ - an Australia-based forum for Land Rover enthusiasts which provides a great source of information concerning all kinds of topics. The Aussies and international crowd who gathered there are extremely helpful and friendly! Alum also has a Facebook group. More or less the German Land Rover forum! Nice and helpful people that can help with any question or problem! "The Hubb" actually is a resource for motorcycle travelers. It provides an enormous amount of information for all people interested in overland travel, be it on motorcycle or any other means of transport. "Horizons Unlimited's" also has a Facebook group. German forum providing a lot of info on travelling the Panamerican Highway written by a guy who travelled the Highway between 1999 and 200 in an old VW bus. A lot of travel information and links to travel-websites and blogs for travelling the Panamerican Highway from Alaska to Tierra del Fuego in almost any kind of vehicle. Wüstenschiff provides all kinds of information for overland travel and is immensely helpful and informative! Comparison of international fuel prices (and other costs of living). The Africa Overland Network portal hosts the best independent overland travel websites. PanAmerican Travelers: Past, Present and Future if you want to travel in the Americas. Land Rover Owners if you are a Land Rover enthusiast. 4xFORUM.com by Andrew St.Pierre White for 4wheel enthusiasts and overlanders alike. "Spark your Dream", the Facebook group connected with the Zapp family. Provides a vast amount of volunteering options and information. Information on traveling and overlanding, a large "collection" of travel blogs including a forum for overlanders. Overlandsphere also has a Facebook group. Rolf Potts' online platform providing an enormous variety of information on nearly any kind of topic connected with travelling, travel-destinations ... don't lose yourself in this, it's simply great! Benjamin and Charli's website full of travel stories, planning-aid and a bunch of other pieces of Information ... great! German magazine providing a lot of information on different 4x4s, gear and offroad travel. “Overland Journal“ is the US-based “publication for environmentally responsible, worldwide vehicle-supported expedition and adventure travel.“ We simply love it for its great international trip reports, gear reviews and wonderful photography! Klaus and Erika Därr are among the most famous German overlanders. They have been almost everywhere. This book is a collection of episodes from their overland-travels between 1969 and 2014. What an impressive life! "Dark Continent" is by no means politically correct, but it's a funny and exciting travel log of an African overlander traveling from Durban via Cape Town to Cairo. Published in 1975, this book is one of "the" "historic" travel books about overlanding in Africa. Of course, much information is outdated but still "Trans-Africa Motoring" is really interesting. "The most comprehensive handbook of its kind, it is essential reading for anyone planning to cross Africa by motor vehicle - without it you might as well stay at home." It's forbidden and almost everybody would argue against doing this, but Stephan Orth has made it: he went couch surfing in the Islamic Republic of Iran, discovering the hospitality, warmth and ingenuity of a wonderful people! Great read so far! If you are able to travel through southern England in an old electric milk car then yo are a “Slow Traveller“. Using the roads less travelled by, far off from the normal tourist routes, throwing over board all rituals connected with modern day travel (such as guidebooks, taking pictures etc. ), don’t visit any “sights“ and start loving catastrophies may not be “relaxing“, but will satisfy through deep experiencing. That is what the “Slow Travel“ philosophy is all about. Travelling itself is what’s important, not reaching a destination. Let’s call this book “The Overlander’s Bible“, because that’s exactly what it is. It provides an enormous amount of information on every step and aspect of planning, converting and overlanding. Overlander’s Handbook is great for planning and dreaming at home, but also has a great “on the road value“ as a wonderful source of information. A “must-buy“! Overlanding actually has two “Bibles“, the “VDEG“ is the first one. Concentrating on every single detail important for vehicle dependent expeditions, the doyen of overland expeditions, Tom Sheppard, wrote this impressive book years ago and it has been published since in several revised editions. Collectors pay large sums for first edition copies. A must buy as well! “50 Jahre afrikanische Un- Abhängigkeiten - eine selbstkritische Bilanz“ by AfricAvenir International e.V. This beautifully made book lets African leaders, poets, writers and artists speak out their reflections on 50 years of African independence. A wonderful background read! This book provides a large amount of information on Ethiopia from the historical, sociological and cultural perspective and goes far beyond everything any guidebook can provide. This book really is a "must read" for every person traveling to Ethiopia. Kapuscinski was almost everywhere and has a lot of stories to tell from his 40-year-experience as a foreign correspondent. His stories and pictures created are rich in detail and simply impressive! This is "the" guidebook for planning any overland trip through Africa providing an immense amount of information on preparation, routes, countries et cetera. This book is a plea for a radical change in development policy. Seitz worked as a German diplomat for 17 years and states that Africa can not be helped by bombastic conferences et cetera, but rather by listening in into the ideas of Africans and respecting them as equals. A driving guide for the adventurous traveler seeking to drive and explore throughout Central America and South America offering a lot of information on planning a trip, document and vehicle preparation, shipping and many other topics. Slightly outdated, as the newest edition is only from 2008. Preparation and Planning aids for traveling the Panamerican Highway. This is the story and history of a unique cultural region ... Jonathan Keates states in the Sunday Telegraph "This memorable study, its scholarship tinged with indulgent humour and an authorial eye for bizarre detail, celebrates the swirling changeability at the heart of that wonderful symbiosis of man and nature which once took place long Mediterranean shores". What more is there to say! The German version of “Where There is no Doctor“. This book may not be a substitute for a good doctor, but can help finding diagnoses alone and ideas for at least an emergency treatment in many medical situations. Maybe because of that, it is part of the standard equipment of a lot of NGOs all over the world. A young German couple on the way to India in 1981 ... After reaching their planned “final destination“, they get the travel bug and go on ... to come back to Germany in 1997. The journey, the time-span, the creative and inventive use of their motorcycles (e.g. to power a raft on the Amazon river), and the encounters on the road simply are impressive. They now live in Tierra del Fuego on a farm. Sabine and Burkhard Koch travelled on African roads for three years and over 80,000 km. There are many travelogs on the market – this one is really worth buying if you want to get an impression on what you are going to expect “on the road“ in Africa. In 1955, six university students from Cambridge and Oxford set off from London in two Land Rovers for the “Oxford and Cambridge Far Eastern Expedition“. They reach Singapore six months and six days later, having a large amount of stories to tell and experiences to share. The book simply is an absolute must for any Overlander, especially if they have a Land Rover, it’s a real Overland-classic! In an old (and unlicensed) Scottish Land Rover, Christopher Many travels around the world for 3000 days and 200,000 kilometres. His experiences from Europe, Asia, the Americas, Africa and Arabia are condensed in this book together with a lot of philosopical thoughts and comments on the political situation between May 2002 and September 2010. Christopher Many is a great vagabonding travel philosopher! This book really is one of our favourites! Toby Green travels through West-Africa (Senegal, Guinea-Conakry, Guinea Bissau) because a Senegalese friend told him that there are “mystics who possess the secrets of how to become invisible and invulnerable“. On his quest to find one of these “Marabuts“, Green discovers a lot about humanity and West-African Culture. This book provides a deep insight into the West-African psyche and is a witty, exciting and honest, sometimes troubling piece of travel literature. Petra and Klaus Vierkotten travelled the Panamerican Highway from Mexico to Tierra del Fuego in Argentina. They started in 2010 and finished their trip three years later after covering about 100,000 km. A really well-to-read travel log! In January 2000, Candelaria and Herman Zapp set off for a half-year-trip from their home-country Argentina to far-away Alaska in a 72-year-old car ... Today, more than 14 years later, they are still traveling. They were outward bound as a couple and now, they're together with their four children that were conceived, born and raised "on the road". See our review!